I'd be lying if I said it wasn't snowing buckets outside my window right now. In fact, the weather has only grown worse as the day has worn on. Now snow might be a welcome sight for some places, namely ski country, but around these parts it just wreaks havoc. You can't drive, you don't want to leave the house, and you can't work out outside--at least not easily. Ah, but you can work out in the elements--and have fun doing it. I might have to take a good, long look at this picture to remind myself of that. But the minute I spy snow and skiing--whether it's of Arapahoe Basin, such as the above shot from Jan. 19, or any other spot in Colorado, Utah or the like--I think of my "happy place." Adam Sandler's version may have had a land full of greenery, a gleeful grandma, a little person riding a tricycle, and a two-handed Chubbs playing the piano, but mine is just as much about the simple pleasures. 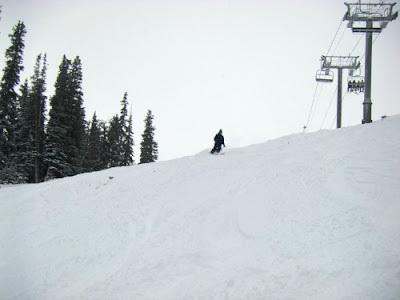 Give me snow, my skis and steeps and I'll be grinning, even when it's overcast and frigid (well, to a degree). Who's with me? Props to anyone who can guess where at Arapahoe Basin this picture was snapped. My bets are on Montezuma Bowl though that's based solely on how I remember Zuma's chairlift. Photo courtesy of Arapahoe Basin.